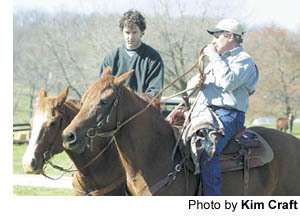 April 11, 2002 — John Hulsey remembers riding his horse down Green Street. He’d clip-clop on over to the old Royal Theater, which used to occupy the vacant lot next to Clore’s Restaurant. He’d tie up his horse and take in a movie. This was the 1960s — not too long ago, really. Back then, Gainesville was more Wild West and less Atlanta. Back then, Gainesville was horse country. And now, Hulsey sees the area experiencing a rebirth in all things equine. The sport that brought Hulsey back to horses is team penning. He picked it up a little more than a year ago, and now he can’t get enough. Team penning is similar in several ways to the horse sport of cutting. But penning is pushy. It’s more offense than defense. And in penning, the cowboys — and cowgirls — make a heck of a lot more noise. Here are the basics: A herd of 30 cattle, numbered “0” through “9” three times over, settles at one end of an arena. As a team of three people on horseback approaches the herd, the public address announcer calls out one of the numbers. The three cattle wearing that number become the targets. The riders must separate them from the herd and get them into a small pen at the far end of the arena in less than 90 seconds. The fastest time wins. Well, it’s supposed to be fast. But two weeks ago, during my first penning lesson at Hulsey’s farm in White County, I was more slowpoke than cowpoke. “You’re not from around here, are you?” asked Hulsey’s penning pal Devin White. The 20-year-old Gainesville High graduate, a horseshoer by trade, insisted he was referring to my accent and not my riding style. That, he tried to blame on the horses. Hobo. Leo. Rusty. I rode them all that morning. Sometimes, the horses wouldn’t go the direction I thought I was directing them. Other times, they wouldn’t go much at all. Hulsey remarked that he had never seen Rusty so reluctant to run. I knew what the problem was. And I’m fairly certain Hulsey and White knew it, too — they were just too nice to say it. The problem was the rider, not the ridee. But they still kept swapping out horses on me anyway. No matter. Any horse can sense when a rider is tense. And I had good reason to be. Penning is not intended for the novice rider. It involves sudden starts and stops and flat-out sprints. Even the most experienced riders can end up in a heap on the ground. That is part of the draw. Hulsey and White — along with a few other local residents, including Hulsey’s stepdaughter Crista Ragsdale — are regulars at the weekly team penning jackpot contests at Mike “Curly” PhillipsÃƒÂ¢ Cherokee Rose Arena in Carnesville. It’s the only show for miles. Every Saturday, penners from across the Southeast — Florida, Tennessee, Alabama, South Carolina, North Carolina and, of course, Georgia — come to ride at Curly’s. The “Spring Fling” belt buckle series at Curly’s is currently at its halfway point, and Hulsey and White are both running in the top-10 in the points standings. I went and watched them a couple of weeks ago. I got there at about 6 p.m. and left at 11 p.m. The riders kept riding for several hours after that. There is money at stake, but not much. Each event pays out 60 percent to the winners. Entry fees max out at $15. It’s not too bad for the spectators, either. At Curly’s, the cattle are always “fresh” — meaning frisky — and successful runs are the exception rather than the rule. You see, the riders have more than just the 90-second limit to deal with. There is a “foul line,” too, typically the halfway point of the arena. Teams are disqualified if they let cattle of the wrong number break from the herd and cross the foul line. Same result if cattle chased toward the pen somehow sneak their way back across the foul line. That makes for some desperate dashes … and savage screams. “Hey! Hey! Hey! 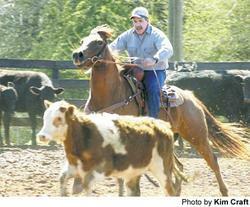 Get back there, you darn cow!” the rider yells, body angled sharply forward, hands steering horse like a stock car. It was chilly that night at Curly’s. Steam rose from the heads of hot horses. But some hot cocoa and a quesadilla from Judy Brown’s kitchen hit the spot. And riders know, cold doesn’t last long in Georgia. “In the summer, God it’s dusty,” Hulsey said as he waited for his next run. “It’s hot and you’ll be out here until 2 o’clock in the morning. And then you’ve got to drive all the way back. And then you’ve got to get up and go to church. And you can always use a new belt buckle, right? What: Year-round competition in team penning, sorting and one-on-one. Entry fees: Range from $5-$15. Events pay out 60 percent to winners. Directions: From Gainesville, take U.S. 129 south to I-85 north. Proceed 17 miles on I-85 to the Ga. 63/Martin Bridge Road exit, number 154. Turn right onto Martin Bridge for .2 miles and turn left onto Ga. 59. Travel 2.3 miles and turn right onto Bold Springs Road. After 5 miles, turn left onto an unnamed gravel road marked by a small “Cherokee Rose Arena” sign. Bear right at fork in road. Arena is on left.